When it comes to finding in-home assistance for senior loved ones, only the best, most compassionate care will do. We at Montebello Home Care have walked a mile in your shoes, searching for a senior in home care provider who would treat our loved ones like family, honor their choices, and improve their health, happiness, and quality of life. We understand how challenging it can be to find all of these qualities in one agency, and that’s why we’ve worked hard to design our agency around quality care, compassion, and solutions. At Montebello Home Care, we strive to create a culture of trust, integrity, and professionalism to greatly impact those we work with and those we care for. Montebello’s Southeast Texas senior home care team has earned the coveted Home Care Pulse Provider of Choice, Employer of Choice, and Leader in Excellence distinctions. The Best of Home Care Provider of Choice Award is given to home care providers who receive the highest satisfaction scores from their current clients, based on live phone interviews conducted by Home Care Pulse, an independent firm that measures customer experience. The Best of Home Care Employer of Choice Award is given to home care providers who receive the highest satisfaction scores from their current caregivers. And the title of Leader in Excellence is awarded a select few home care providers who set the highest standard, receiving the highest client and caregiver satisfaction scores in all categories. Our commitment to quality and hospitality extends to every aspect of client care, from hiring the best caregivers to ensuring all clients have a small team of caregivers with whom they can form strong bonds. Our caregivers are also highly trained and supervised by our office supervisors so you know your caregivers are always top notch. 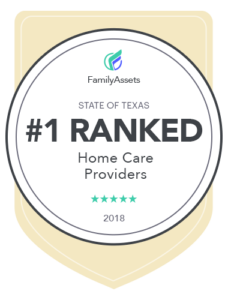 Montebello Home Care is also proud to have been named a #1 Ranked Home Care Provider for the State of Texas by FamilyAssets. FamilyAssets was established as an advocate for people who are searching for care options for themselves or their loved ones. 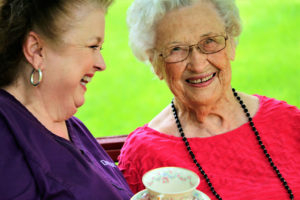 Our #1 rank with FamilyAssets ensures that our home care services are top quality. Additionally, Montebello Home Care is being recognized as a Caring Star of 2019 for non-medical in-home care, based on ratings and reviews from our clients. To qualify for the recognition, agencies must have 10 or more consumer reviews on Caring.com and an overall average rating of 4.5 out of 5 stars, among other criteria. As a Caring Star agency, our clients and their families can have peace of mind knowing that their loved ones are in good hands. We truly love caring for others and helping seniors live their best lives possible with the best possible services. We’d love to talk to you more about why Montebello Home Care is the best in home care provider for your family. Give us a call any time at 409-276-7576 or fill out our online contact form to speak to someone from our Lumberton, TX home care team.